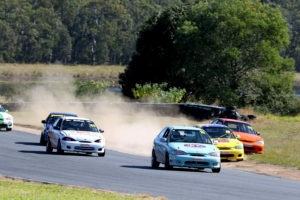 After a four-week break, the teams and drivers, of Track Attack Australia Excel Cup, ventured to Lakeside Park for the third round of the 2018 season. As was the case in the opening round, back in April, the entry list exceeded the allowed track density, which saw the relegation system back in play for the weekend, which made Qualifying vitally important. 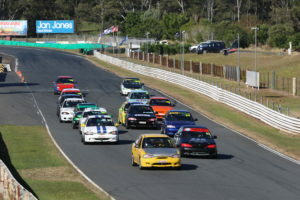 From Race 1, the fifteen competitors who failed to qualify in the main field would compete in a B-Race, in which they’d fight for the right to join the main field for race 2, but that would come at the expense of the last two cars in the main field, who would be relegated, and made to work their way back into the main field. 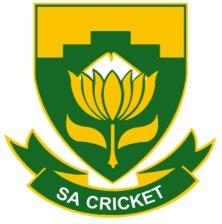 The relegation system ensured there’d be plenty of excitement throughout the entire field this weekend! Scott Green continued his impressive Qualifying form, by taking his second pole position of the season, and second in succession, just ahead of Cam Wilson, with Tyrone Gautier recording his best qualifying performance on the season, so far, in third, while Mick McCloud and Brett Parrish rounded out the top five. 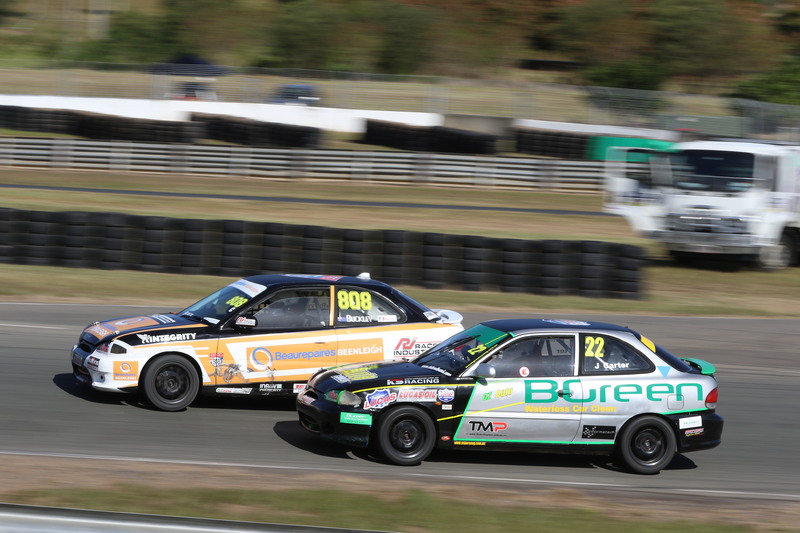 Round 1 winner, Darren Whittington was forced to settle for seventh, but some key contenders were a lot further down the order than that – Simon Winters could only manage 15th, Robert Buckley was 18th, while Daniel Peasey had some mechanical dramas, and could only manage 19th. The entire A-grid was separated by just 2.15 seconds, after Seiton Connor-Young and Gabriel Gasperak moved into the main field, for race 1, after being the fastest two qualifiers in the ‘B’ session. Everyone else would contest the ‘B’ race later in the morning. The day went from bad to worse for Daniel Peasey – unable to resolve the mechanical dramas that hampered his progress in Qualifying, he was a non-starter in the opening race of the weekend, and that raised quite the conundrum for both Peasey and series officials. Given that the relegation system was in play, and he, as a non-starter, was the last car in the A-field, there was speculation that Peasey would be relegated to the B-field for Race 2 later in the day – a move that would’ve been quite detrimental to, not only his round hopes – which had already been dealt a blow with this non-start – but his title aspirations as well. Series officials, knowing that Peasey is one of the outright contenders, handed the #37 a lifeline, by allowing him to start from the rear of the A-field for Race 2. With that, there was a slight change to the relegation system for the opening race of the weekend, with only ONE car to be demoted from the A-field, for Race 2. In the B-field, the first TWO finishers would be promoted as usual, and series organisers had the ability to do that, as they weren’t yet running a full grid (of 24 cars) in the A-Race. Despite Peasey’s absence from Race 1, there was no shortage of entertainment. Scott Green converted his pole position into an early race lead, but he didn’t stay there for long, as Cam Wilson made his way by on the second lap of the race. Behind them, Mick McCloud was the head of a five-car battle that included, in no particular oder, Tyrone Gautier, Brett Parrish, Darren Whittington and Frank Mammarella. Wilson and Green put on a tremendous show at the head of the field. They were nose-to-tail, or side-by-side, for much of the race, particularly on the main straight, as Wilson would hold the inside line, often forcing Green to try the outside line if he was to attempt overtaking the defending champion at the Karousel. Green found a way past Wilson on Lap 8, but was looking directly at the rear of the #1 again on the very next lap, as Wilson restored order once more. Wilson continued to lead until the last twenty metres of the final lap. Scott Green got a tremendous run off the final corner, and used the slipstream to his advantage, to pull out of the draft, draw up alongside Wilson, put his nose in front, and edge out the #1 by the narrowest of margins – 0.0104 – to claim his second win of the season. Behind Wilson was his Phillips Wilson Racing team-mate Mick McCloud, who finished ahead of Tyrone Gautier, Darren Whittington, Brett Parrish and Frank Mammarella – it was anyone’s guess the order in which they would cross the line, as positions changed constantly throughout the 10-lap affair. Just the one retirement in the opening race, and that was Gabriel Gasperak, who came unstuck on the very last lap. It was a double blow for Gasperak, because retirement meant relegation. Simon Winters was the biggest mover in that opening race. After a difficult qualifying, which saw him start from fifteenth position, he moved his way through to eleventh. In the race for promotion, Darren Currie was a clear winner, finishing four seconds ahead of Scot Haggarty, but it was the battle for the minors that stole the show, and our attention. Just 1.6 seconds separated the next five cars – Thomas Needam, Joshua Richards, David Potter, John Carter and Xander Antonieff, and while they might’ve all been racing for the same amount of championship points (one), it was clear that track position still meant something to them, despite the fact that they missed out on getting into the main field, where the big points were on offer. 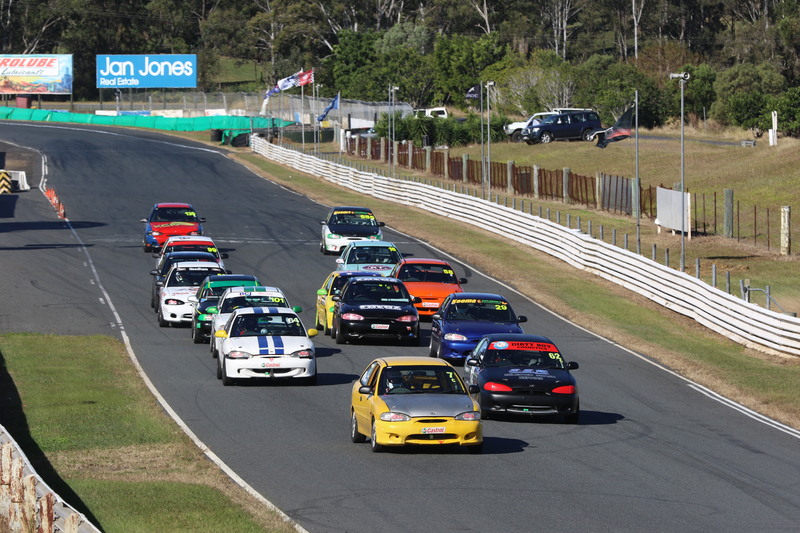 The good news from the opening B-Race of the weekend, was that all fifteen starters finished the race. Race 2 for the main field was next up, and, once again, it was a battle between Scott Green and Cam Wilson. Wilson won the start, and took the early lead, leaving Green to follow in his tracks. Mick McCloud slotted into third place, but once again, the battle between Parrish, Gautier, Whittington and Mammarella was on. From the back of the grid, Daniel Peasey wasted no time in working his way through the field. He was 18th by the end of lap 1, and would eventually work his way through to twelfth position. 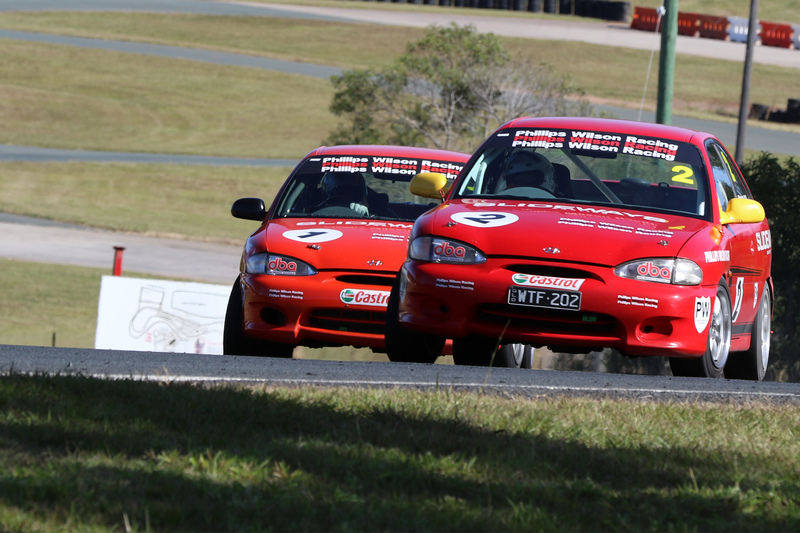 Simon Winters also worked his way forward in that second race, to finish in eighth position, after starting eleventh. At the front, Wilson continued to lead the race, but not by a comfortable margin – he was under tremendous pressure from Scott Green for the entire race, with the Scott’s Rods entry constantly trying to find a way by the defending champion. Further back, McCloud, Gautier and Parrish broke away from Whittington and Mammarella in the closing laps, leaving us with a three-way fight for third. That came not long after Gautier was able to find a way by Whittington, to move into the top five. 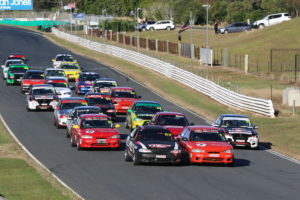 In the end, it was a case of de ja vu – the second race ended in exactly the same fashion as the first – a drag race between Scott Green and Cam Wilson, in which Green edged out the defending champion (again), to record his second win of the day, and third of the season. This time around, the margin was one-tenth of a second, but, once again, it was all about the run off the final corner, and Green aced it. McCloud was third once more, ahead of Parrish, Gautier, Whittington and Mammarella – that battle wasn’t as fierce as the opening race, as Parrish and Gautier had breathing space over Whittington and Mammarella in the end. Simon Winters continued to move forward, finishing eighth, ahead of Daniel Natoli, and Josh Brown – after starting fifteenth – rounded out the top ten. In the ‘B’ race, a standout performance from Joshua Richards saw him take a commanding eight-second victory over Gabriel Gasperak and John Carter, while Xander Antonieff and David Potter rounded out the top five, in a race that had far less action than the opener earlier on. While both Richards and Gasperak joined the ‘A’ field for Race 3, no drivers were relegated from the ‘A’ field, as it grew to 24 cars – a full grid – for the final two races of the weekend. Sunday morning dawned cloudy, but clear, and race 3 began just like the previous two, with Wilson and Green going toe-to-toe, and it was Green who secured the lead, as the field hit the Karousel for the first time. A big moment for Gordon Smith, at Hungry, brought Dave Shinners unstuck. While Smith was able to resume, Shinners was stranded in the middle of the circuit, and that saw the race neutralised. Just before the clampdown was called, Mick McCloud was able to get by Brett Parrish, to move into third position. It was unfortunate for Dave Shinners – mechanical dramas have plagued both his visits to Lakeside Park so far in 2019. Upon resumption, the battle between Green and Wilson resumed, and then erupted – contact between the pair, at the exit of the karousel, saw Green turned around. Wilson took the race lead, as Green dropped to the very back of the field. The Saturday race winner was able to resume, but his chances of victory had evaporated. Wilson’s run at the head of the field didn’t last long, as he was passed by his team-mate, Mick McCloud, on the very next lap. Daniel Peasey, after starting 12th, was working his way through the field, to be running in eighth position at the half-way mark, and was in a fight for position with Darren Whittington, Scott Kelly and Daniel Natoli – who was having his best run of the season thus far. Behind Wilson, a cracking battle for third, between the BPRO squad entries of Brett Parrish, Tyrone Gautier and Simon Winters was unfolding, with Gautier throwing everything at it, in his bid to secure the final spot on the podium. 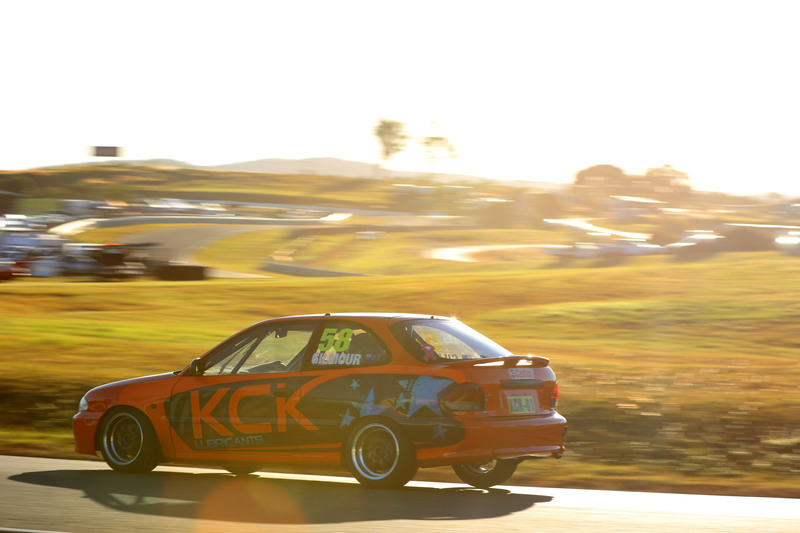 On the last lap, the race was stopped, and therefore declared, when Josh Brown found the tyre wall at the top of the Eastern Loop. The driver was OK, but the car was not, and that resulted in Brown not being able to contest the final race later in the day. 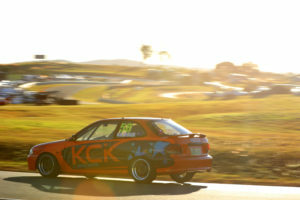 While the finish of that race was a bit of an anti-climax, to Mick McCloud it was anything but, as he claimed his first win in the Track Attack Australia Excel Cup, and became the seventh different race winner of season 2019 in the process. Wilson was second, ahead of Parrish, Gautier and Winters. Daniel Natoli was sixth – his best finish of the season, with Daniel Peasey, Darren Whittington, Scott Kelly and Ben Smith rounding out the top ten. Scott Green salvaged 16th position, but was promoted to 15th post-race, after officials slapped Cam Wilson with a 30-second penalty, for his role in the incident, with Green, earlier in the race. The penalty saw Wilson drop from 2nd to 20th, and promoted Holly Espray to the final spot in the top ten. Again, official discretion saw Frank Mammarella and Dave Shinners avoid relegation, but it meant that only one promotion spot was available, for the penultimate ‘B’ race of the weekend. The third ‘B’ race produced some of the best racing of the weekend, as John Carter took the early lead, ahead of Xander Antonieff and Jason Haren, but as the race progressed, the big mover was Thomas Needam, who moved from 6th on the opening lap, to be in second by the end of lap 9, and chasing down John Carter who, up until that time, hadn’t looked like losing the lead. 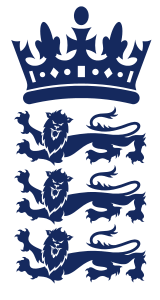 Off the final corner, Needam attempted a move on Carter, but fell short, as John Carter earned promotion into the big dance – the final ‘A’ field race of the weekend – but did so by only 0.1342 over Needam. Antonieff drove brilliantly to grab third, with Jason Haren and David Potter rounding out the top five. The final race of the weekend promised fireworks, and boy did it deliver. Off the start, Mick McCloud took the lead at the Karousel, despite Brett Parrish trying to force the issue on the outside. Simon Winters made a terrific start, to sit ahead of Tyrone Gautier, and Daniel Peasey, who got the better of Daniel Natoli off the start. Cam Wilson wasted no time fighting his way through the field – moving up to 14th before the end of the first lap. 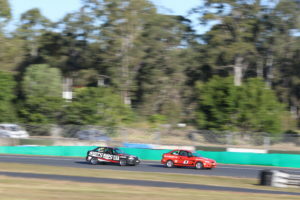 Natoli’s run, at the pointy end of the field, ended on lap 2, when Scott Kelly and Darren Whittington went on by, sending him back to eighth position, and that soon became ninth when Cam Wilson passed him, around the outside at the Eastern Loop. All hell broke loose on the following lap. Contact between Cam Wilson and Scott Kelly set off a chain reaction, with Kelly, Ben Smith, Holly Espray, Aaron Cameron and Daniel Natoli all caught up in the incident. Officials had no choice but to stop the race. Those still running returned to pit-lane, to await the restart, as track marshals went to work, to clear the wreckage at hungry corner. Cam Wilson returned to pit-lane sporting a fair amount of damage, and while it looked as though he was going to try and get the car repaired for the restart, he ended up retiring from the race, leaving just nineteen cars to take the restart. Also out of business were Daniel Natoli, Ben Smith, Holly Espray and Aaron Cameron. 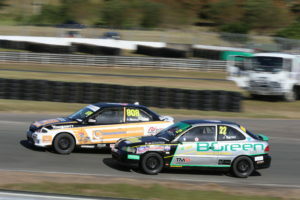 At the time of the stoppage, Daniel Peasey had moved forward to 5th position, while Scott Green, after starting 15th, had only moved up one place, to be sitting in 14th position. With Wilson and Espray out of business, the hopes of the Phillips-Wilson Racing squad rested on the shoulders of Mick McCloud, and he didn’t disappoint. From the single-file restart, McCloud maintained his race lead, ahead of Brett Parrish and Simon Winters, while Gautier, Peasey and Whittington rounded out the top six. Despite the incident with Cam Wilson, Scott Kelly continued on, but the incident did him no favours, as he just went backwards in the second part of the race – losing track position to Frank Mammarella, Gordon Smith, Scott Green and Dave Shinners, as he dropped from 7th to 11th in the space of just three laps. Peasey and Gautier engaged in a cracking scrap for fourth, with both men on the winning end of the battle at various points throughout the remainder of the race, but it was Daniel Peasey who would prevail with fourth in the end. Sadly, as was the case in Race 3, and also both Sunday races at the opening round of the season back in April, this race failed to run full distance. Joshua Richards had a big lose through the kink, and speared off into the tyre wall on the outside of the circuit, on the approach to the karousel, and triggered another race suspension, but with nine laps completed, this stoppage signalled the end of the race – there would not be a second restart. 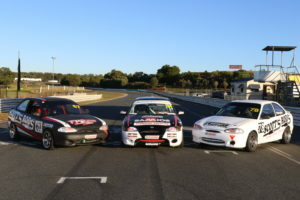 It was unfortunate for Richards, who drove so well on Saturday, to earn promotion into the main field, and he was battling with Robert Buckley, Tomas Gasperak and Darren Currie at the time of the incident. It was a lucky escape for Richards, on two counts, as he walked away OK, and was also listed as a classified finisher – in 13th – as the race results were counted back to the end of Lap 9 – about seven seconds before his race came unstuck. With the race declared on Lap 9, Mick McCloud secured his second win of the day, ahead of Brett Parrish and Simon Winters. Daniel Peasey was fourth, with Tyrone Gautier rounding out the top five. Behind them, Darren Whittington, Frank Mammarella, Gordon Smith, Scott Green and Dave Shinners made up the ten, in what was a good fight back from both Mammarella and Green, after their respective misfortunes earlier in the day. While the main results had been decided, there was still one final ‘B’ race to be contested. The ‘B’ field started the weekend with 15 cars, but with less relegation than promotion throughout the weekend, only 11 would line up for the final race of the day. 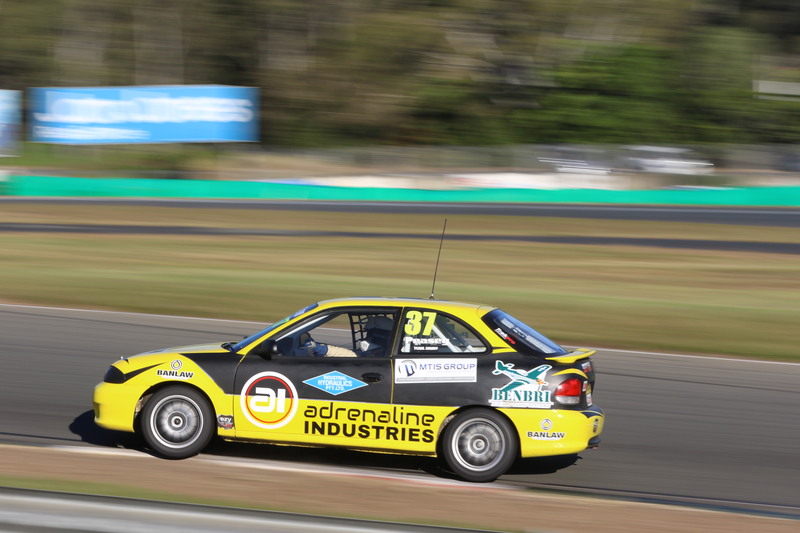 Following that brilliant drive in Race 3, Thomas Needam started from pole position, and was never challenged, as he cruised to a massive eight-second victory. Behind Needam, drama on lap 5 saw Jason Haren’s race end prematurely – he was running second at the time, when mechanical dramas ended his race. Haren’s retirement allowed Harry Haggarty into second position, ahead of Ashley Izod – both of them got by Xander Antonieff a couple of laps earlier. Antonieff was, by this point, running in fifth place – after Matthew Gilmour also found his way by the youngster– and he was now engaged in a gripping battle with Greg Robertson. Back at the front though, no one was catching Needam – he took the win, ahead of Haggarty, Izod, Gilmour and Antonieff, with Robertson sixth, by just 0.0661. 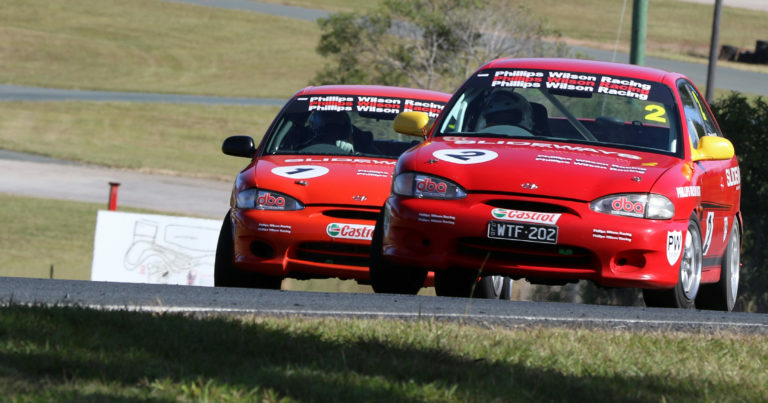 So, in the final wash – Scott Green’s Sunday misfortune saw Mick McCloud secure the Phillips Wilson Racing squad its first round win of season 2018, but it came on a day where the defending champion’s title defence ended. Wilson was suspended from competition for 90 days, for his involvement in the multi-car wreck at Hungry Corner, meaning he would miss the next two rounds of the series. 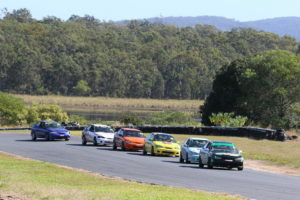 Behind McCloud, Brett Parrish was second for the round, ahead of Tyrone Gautier, Scott Green and Simon Winters, while Darren Whittington was sixth. 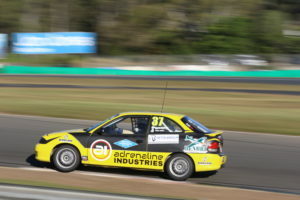 For Gautier, it was his best result of the season, and for Brett Parrish, it was the round where he stole the championship lead away from, his team-mate, Darren Whittington, with an 80-point haul on a chaotic weekend, where few of the top contends successfully navigated their way through the carnage unfolding around them. With Darren Whittington only scoring 60 points, his 6-point advantage quickly turned into a 14-point deficit, as it became clear that BPRO were going to be strong contenders – as they always are – in this closely fought championship. The Track Attack Australia Excel Cup won’t return to Lakeside Park until November’s season finale. 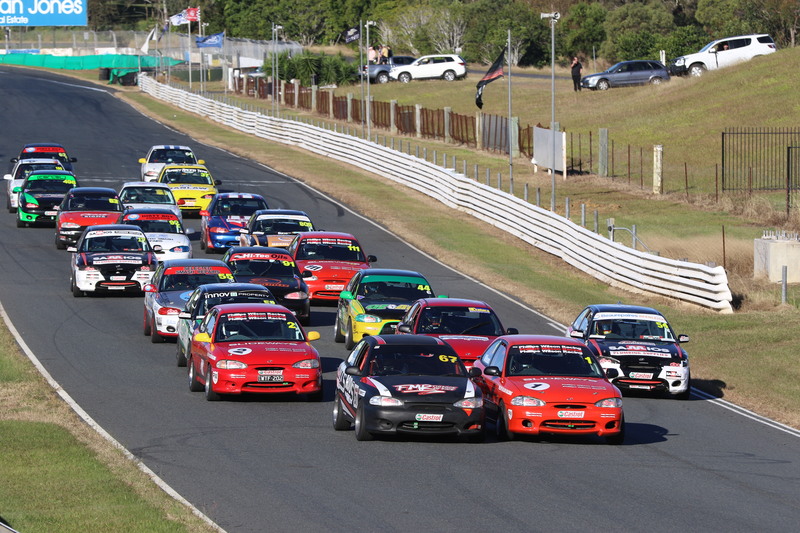 The next round will see the category in action at ‘2 Days of Thunder’ (June 22-24), before backing up for the fifth round of the season, at the fourth event of the 2018 Queensland Racing Drivers Championship, just a fortnight later (July 6-8). Championship Points | After Round 3 of 8.